Do not be bamboozled by Highways England or their contractors. There are many facets to a claim, lots of figures, much documentation but most issues come down to the basic cost of a component whether it is an Operative (person on the ground), Staff (office worker), Plant (vehicle) or Material (barrier, nuts and bolts etc.). But we reveal them - click here. 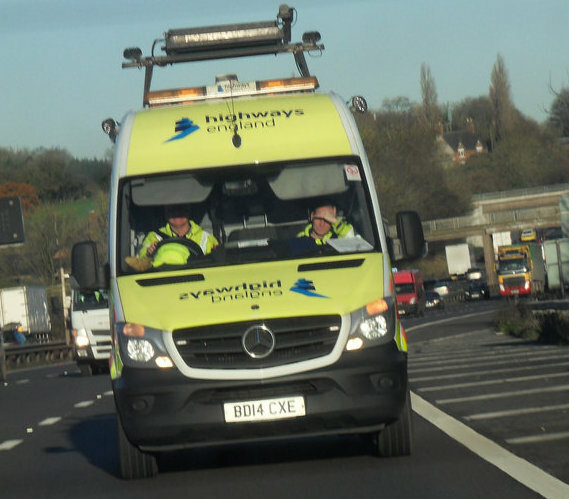 Image - BD14CXE Kier Highways AIW vehicle £36.91 / hour to a Third Party, half that to Highways England, containing two AIW (Asset Inspection Watchmen), about £25 / hour each to Highways England … £65+ / hour to a Third Party … though after 5pm, because they work 8am to 5pm, they are said to be paid 1.5x** their salary and are charged to a Third Party @ almost £100 / hour. Of a weekend, said to be paid double-time**, they are charged at £130 / hour. *AIW do not work 8am to 5pm, they work shifts. It is claimed they work ‘core hours’ (office hours of 8am to 5pm to justify the uplifts applied. ** AIW’s tell us they are NOT paid the uplifts.